All callin bindings of a team only have effect if the team is active. Activation may be caused by explicit statements and also happens implicitly at certain points during program execution. Callin bindings can further be controlled using guard predicates, which can be attached to roles and teams at different levels. If a guard predicate evaluates to false, all affected callin bindings are disabled. Activating a team instance has the effect of enabling all its callin bindings. All effects defined in §4 apply only if a corresponding team instance is active. The order of team activation controls the order of callin executions. If more than one team intercepts calls to the same base method, the most recently activated team has highest priority in that its before or replace callins are executed first while its after callins are executed last. While thread local activation only enables the callin bindings of a team instance for a certain thread, global activation activates the team instance for all threads of the application. Any active team is referenced by internal infrastructure. Thus, a team cannot be reclaimed by the garbage collector while it is active. In these statements, myTeam must denote a team instance. For the time of executing this block, this team instance is activated for the current thread, which has entered the within block. The within block statement guarantees that it leaves the team in exactly the same activation state as it was in when entering this block. This includes the cases of exceptions, meaning that deactivation will also occur if the execution of the block terminates abnormally. Each team class implicitly provides methods from the predefined interface org.objectteams.ITeam (super interface of all team classes) to control team activation disregarding the block structure of the program. The methods activate() and deactivate() are used to activate and deactivate a team instance for the current thread. If a team should be de-/activated for another thread this can be done by the methods activate(Thread aThread) and deactivate(Thread aThread). In order to achieve global activation for all threads the predefined constant org.objectteams.Team.ALL_THREADS is passed to these methods (e.g. activate(Team.ALL_THREADS)). Note, that this methods make no guarantees with respect to exceptions. If activate() is invoked on a team instance that has been explicitly activated before, this statement has no effect at all (note the difference in §5.3. (a) below). The same applies to deactivating an inactive team. If a team was already active when entering a within block, it will remain active after leaving the block. If the team was active on entry of a within block and if deactivate() is invoked on the same team instance from within the within block, leaving the block will re-activate the team. Implicit team activation is intended to ensure that whenever the control flow is passed to a team or one of its roles, the team is implicitly activated for the current thread. Implicit activation can be configured at different levels (see §5.3.(d)). When implicit activation is enabled a programmer may assume, that whenever a role forwards calls to its base object via callout, the callin bindings of the same role will be active at that time. Exceptions to this rule have to be programmed explicitly. While executing a team level method, the target team is always active. Activation is reset to the previous state when leaving the team method, unless the team has been explicitly activated during execution of the team method by a call to activate(). Explicit activation is stronger than implicit activation and thus persists after the team level method terminates. Ie., leaving a team level method will never reset an explicit activation. Invoking a method on an externalized role (see §1.2.2) also has the effect of temporary activation of the team containing the role for the current thread. Regarding deactivation the rule of §5.3. (a) above applies accordingly. Implicit activation of a team causes the activation of its outer teams. Implicit deactivation of a team causes the deactivation of its inner teams. Implicit activation is disabled by default and can be enabled by adding the annotation @org.objectteams.ImplicitTeamActivation, which can be applied to a type or a method. When applied to a method it is ensured that invoking this method will trigger implicit activation. When the annotation is applied to a type this has the same effect as applying it to all externally visible methods of the type. Member types are not affected and have to be annotated separately. Implicit activation is completely disabled. This is the default: implicit activation applies only where declared by @ImplicitTeamActivation. Note that among the different mechanisms for activation, within is strongest, followed by (de)activate(), weakest is implicit activation. In this sense, explicit imperative (de)activation may override the block structure of implicit activation (by explicit activation within a team level method), but not that of a within block (by deactivation from a within block). Guards can be specified as regular guards or base guards, which affects the exact point in the control flow, where the guard will be evaluated. Depending on the kind of guard different objects are in scope using special identifiers like this, base. Any predicate expression that evaluates to true enables the callin binding(s) to which it applies. Evaluation to false disables the callin binding(s). A guard predicate should have no side effects. A compiler should optionally check this condition, but inter-procedural analysis actually depends on the availability of appropriate means to mark any method as side-effect free. A guard predicate should not throw any exceptions. Yet, any exception thrown within a guard predicate cause the guard to evaluate to false rather than propagating the exception, meaning that the evaluation of a guard predicate will never interrupt the current base behaviour. A compiler should flag any checked exception that is thrown within a guard. Such diagnosis should by default be treated as an error, with the option of configuring its severity to warning or ignore. This group of guards evaluates within the context of a given role. These guards are evaluated after a callin target is lifted and before a callin bound role method is invoked. Such a guard only affects the callin binding to which it is attached, i.e., this specific callin binding is only effective, if the predicate evaluates to true. The role instance denoted by this. Features of the role instance can also be accessed relative to this with or without explicit qualifying this. The team instance denoted by a qualified this reference as in MyTeam.this. If the callin binding includes signatures (as in the example above): Parameters of the role method. If parameter mappings are involved, they will be evaluated before evaluating the guard. A method guard is similar to a method binding guard, but it applies to all callin method bindings of this method. The role instance denoted by this (explicit or implicit, see above). Thus, in the example value will be interpreted as a field of the enclosing role. A guard specified in the header of a team class may disable the callin bindings of all contained role classes. The syntax corresponds to the syntax of role level guards. The only value directly available within team level guard is the team instance (denoted by this) and its features. Of course all guards can also access any visible static feature of a visible class. Even if a guard has no direct effect, because, e.g., a role class has no callin bindings (maybe not even a role-base binding), predicates at such abstract levels are useful, because all predicates are inherited by all sub classes (explicit and implicit). Role creation triggers execution of a role constructor (see custom lifting constructor (§2.3.1. (c))) which could produce arbitrary side-effects. Both kinds of side-effects can be avoided using a base guard which prevents unnecessary lifting. 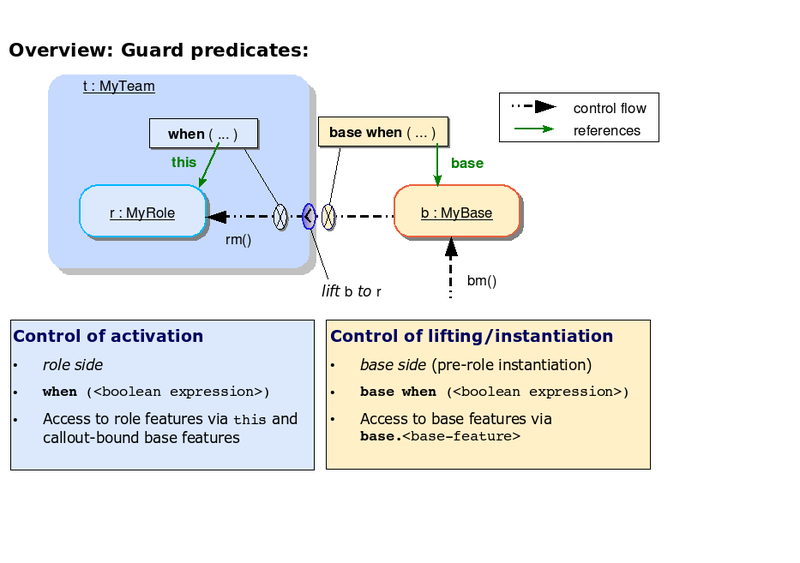 In all base guard predicates the special identifier base can be used to denote the base object that is about to be lifted. A base method binding guard may access parameters as passed to the base method. Parameter mappings are not considered. Additionally, for after callin bindings, the identifier result may be used to refer to the result of the base method (if any). In order to achieve the same effect of accessing the base method's result, a regular binding guard (not a base guard) must use a suitable parameter mapping (see §4.4.(c)). In contrast to regular method guards, a base guard attached to a role method cannot access any method parameters. See the next item (d) for values that are actually in scope. The base instance using the special identifier base. The team instance using a qualified this references (MyTeam.this). Team level base guards have the same scope as role level base guards (d). However, the type of the role instance is not known here, i.e., here base has the static type java.lang.Object. In contrast to regular guards, base guards cannot be attached to unbound role classes nor to their methods. Only team level base guards are independent of role binding. Due to the different ranges of applicability different guards may affect the same method binding. In that case all applicable guards are conjoined using a logical and. The direct predicate expression of the guard. The guard at the same level that is inherited from the implicit super role. The guard at the same level that is inherited from the explicit super role. The team in this example causes that an additional fee has to be payed while debiting less than 1000 Euros from a "foreign" account. The base guard in line 4 ensures that Account objects only get ForeignAccount roles, if they belong to a different bank than the surrounding ATM team. It accesses the bank of the base via the base identifier. The method binding guard in line 10 restricts the callin to debitWithFee to calls where the base method argument amount is lower than 1000. A call to Account.debit causes a replace callin to debitWithFee only if both predicates evaluate to true. If an application should be adapted unanticipatedly by one or more teams, this can be achieved without explicitly changing the program code of this application. Instead of adding the team initialization and activation code to the main program, it is possible to add the respective teams via a config file. Every line of this text file contains the fully qualified name of a compiled team, which has to be available on the classpath. For the instantiation of these teams the default constructor is used, which means adding a team to an application this way requires the team to provide a default constructor. The activation order (see §5.1) for these teams corresponds to the order in which they are listed in the config file. Lines starting with a '#' denote comment lines. has to be used when starting the application. In the ObjectTeams Development Tooling (OTDT) teams are activated unanticipatedly via a special tab in the "Run-Configuration" (see OTDT features), instead. Teams added via the config file mechanism are activated by default. Because no reference to them is stored anywhere, it is not possible to deactivate them later. If deactivation of unanticipated added teams is required, this can be achieved by adding a manager team via config file and encapsulate the actual functionality in another team managed by the manager team. This way a functional team can be activated and deactivated as needed. startMethod and stopMethod are methods which demand the activation and deactivation respectively. If the activation/deactivation depends on other conditions these can be checked in addition.